I have lots of them. History says that Ernest Hemingway made the Moleskine famous, but I suspect that is more a romantic fable than truth. Truth is, these little books were readily available in Paris and were used by a number of people, both famous and not. The writers and artists loved them in particular because the paper was good quality and the size was right for travel. an Italian company brought them back to life. Most are now “Made in China”, so the romance is lost for me. However, the love affair continues. 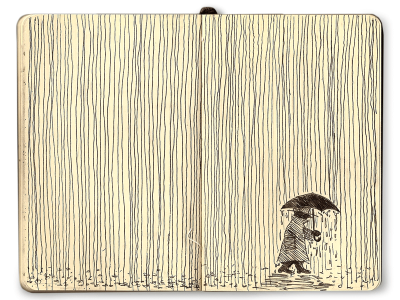 There are hundreds of photos of people’s Moleskine pages on the internet. I have posted several of them here. They are proud of their musings, drawings, reflections, quotes, stories, scribblings, poems. You can find almost every conceivable physical manifestation of thought and imagination. I, too have taken photos of a couple of my pages, to show to you, of course. What do I keep in mine? I keep one with me when I am reading. I like to copy quotes from books that speak to me, as well as words that are new to me, along with the sentence in which they are used, and the definition from my trusty unabridged edition of The Random House Dictionary of the English Language. I have another smaller book for a daily Haiku that I write. Why do I write these? To make sure it’s right. I have another containing Life Lessons According to Carmen. All-in-all, they fill some sort of need that I have. A need to put pen to paper. A need to make lists, draw pictures, see my thoughts rather than just feel them.